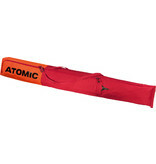 The new Atomic Ski Bag Padded is 195cm long and has room for one pair of skis and poles, protecting them from damage with high quality full-on padding. It has a zip that runs the length of the bag to make it really easy to pack. It also features our Ski Length Adjuster. With this system you can easily adjust the length of the bag down to 180cm or 165cm. This means your skis are always tightly packed and never slide around, which is when damage can occur. It’s also easy to carry with an adjustable shoulder strap and padded handle.